Olympic Reporting: How Far Is Too Far? It seemed as if Pikus-Pace wasn’t prepared in that moment to talk about it, because Vieira brought up the topic so quickly and continued to ask questions about it. 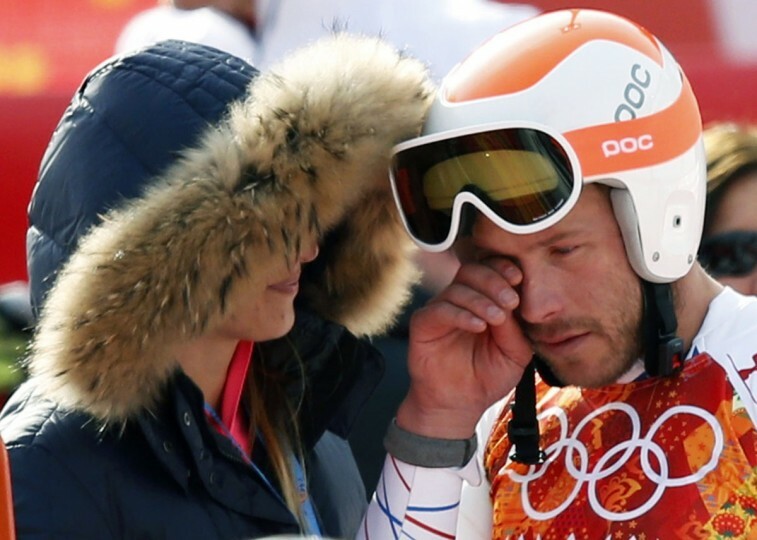 Although it did connect to her reasoning for continuing with the sport, as she said it was her husband’s idea to help her cope with the miscarriage, there is still questioning as to if this interview was too personal. After winning the bronze medal in the men’s super-G on Sunday, Bode Miller similarly shared a personal post-competition interview. This time, however, it was not in the studio and occurred minutes after he found out he had won the bronze. NBC’s Christin Cooper asked him a few questions about his win, and when she asked what made this medal different from others, Miller brought up his brother, Chilly, who had passed away last year. This interview was different from Pikus-Pace’s, in that he brought up the personal topic himself, but it was the way that Cooper continued with the interview that bothered viewers. She then continued to ask him why he was showing so much emotion, which shows that she did notice Miller quickly becoming upset when talking about his brother. However she didn’t move onto another question to dilute the situation or to help Miller regain his composure, she instead went on to ask if the performance was for his brother. As Miller started to answer the question, tears began to well up in his eyes, to the point that he was wiping them away, and before finishing his answer, Cooper asked, “When you’re looking up at the sky at the start, and we see you there, it just looks like you’re talking to somebody. What’s going on there?” To this Miller completely broke down, didn’t answer the question, put his head down, walked away, and knelt down on the floor away from Cooper. Although he did defend Cooper, his most recent retweet jabs at NBC Olympic’s producers which shows that he did actually find some fault in the interview. To see exactly what happened, the interview is posted below. These interviews have been bringing forth a lot of attention and anger towards NBC producers, especially in Bode Miller’s case, and cause the public to question the true intentions of Olympic coverage. Are they trying to trying to show Olympic achievement or be more of an entertainment production by provoking athlete’s emotions? The first weekend of the Sochi Winter Games are finished and a number of major events have concluded with American victories. 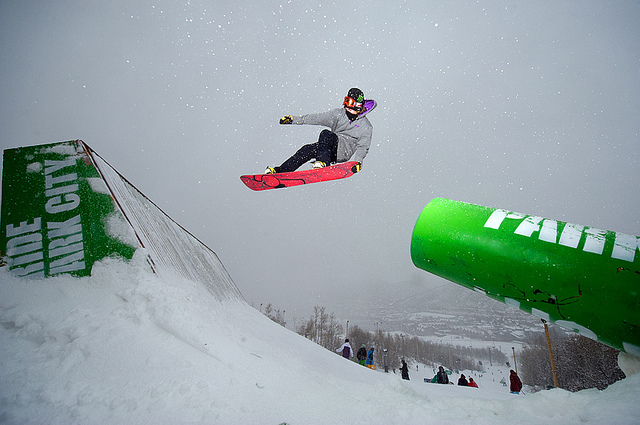 The most notable of these first American medals are in the new slopestyle event. 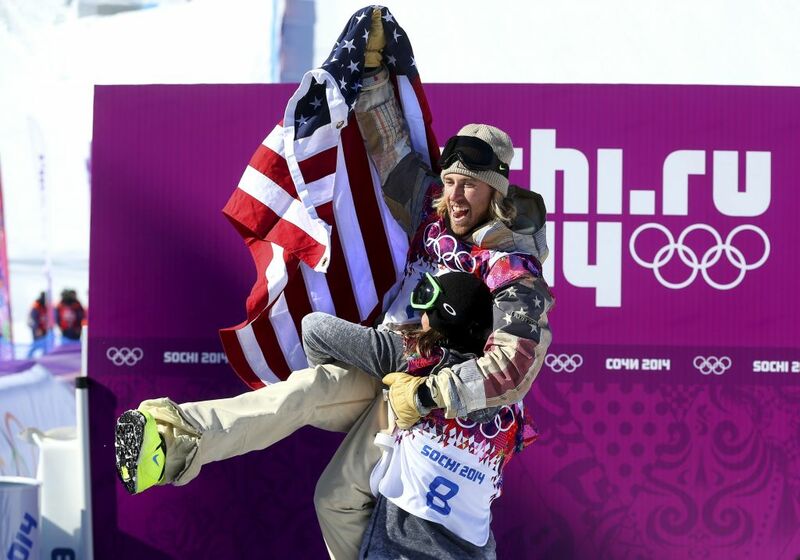 America’s Sage Kotsenburg and Jamie Anderson both won the gold in their respective slopestyle competitions. If you don’t know what slopestyle is, it’s most likely because it’s the first time this event has been a part of the Olympics. It involves a course that takes the skiier or snowboarder on a series of rails and jumps, where they are judged on their style and execution of various tricks. 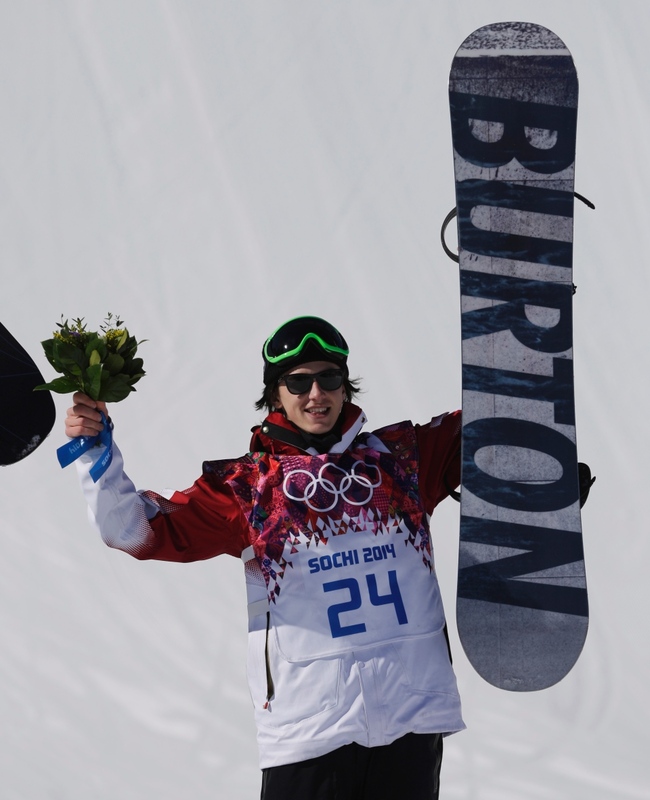 In the men’s snowboarding slopestyle competition, the favorite was Mark McMorris of Canada who won a silver medal in the 2013 World Championships and Gold medals at the 2012 and 2013 X Games. What also made him notable was the fact that he had broken a rib during the 2014 X Games slopestyle competition. He was able to come back and become healthy enough to compete in the Sochi Olympics and still remain at the top of the competition. However in his first run of the Olympic slopestyle final round, he fell and was required to depend solely on his second attempt to get a better score. Completely opposite, Sage Kotsenburg of the United States had one of his best runs during the final’s first round, and with a score of 93.5, no one was able to match it the rest of the event. McMorris ended up winning the bronze, Staale Sandbach of Norway got the silver, and Kotsenburg became the first American to win a gold medal in the Sochi Games and the first ever Olympic slopestyle gold medalist. During the competition, Kotsenburg went to Twitter to express his disbelief at even making the finals. However, once he sealed the victory, his next tweet expressed gratitude towards his fans and complete excitement in the achievement. 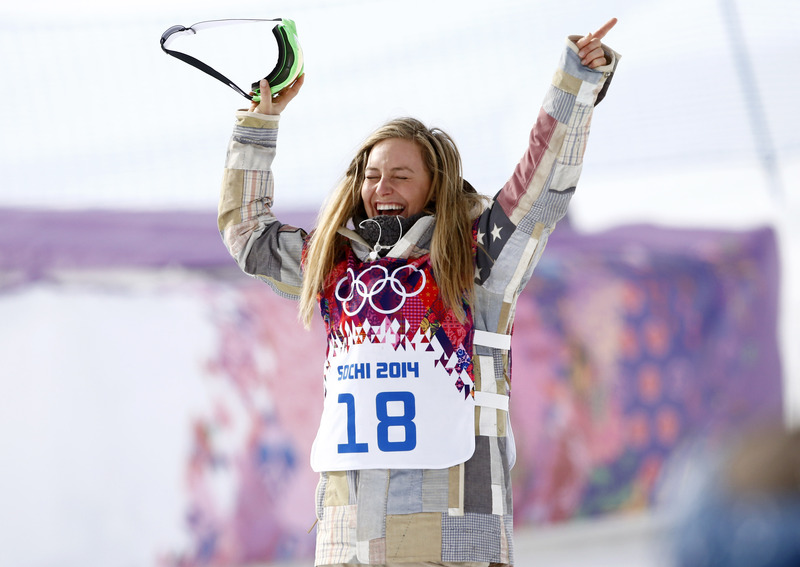 Women’s slopestyler Jamie Anderson followed in his footsteps with a gold medal in the next day’s competition. Her story was a little different in that she had long been the favorite to win the event. After a disappointing first round in the finals, she had to depend solely on her second run, just as McMorris had to do the day before. 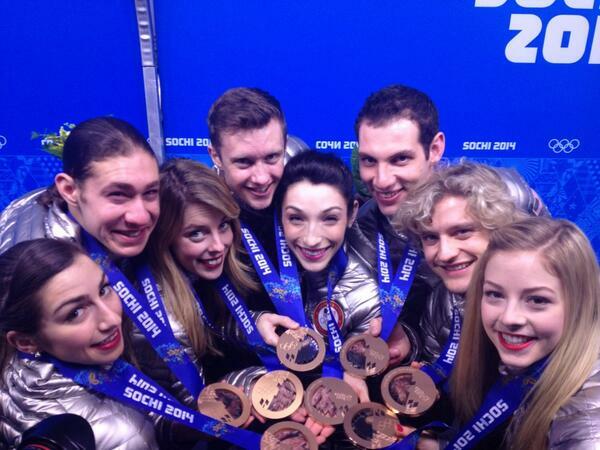 However, her outcome proved to be different than McMorris and was the best run of the day. With a score of 95.25, she took gold with her closest competitor, Finland’s Enni Rukajarvi, scoring a 92.5 and taking the silver. Anderson winning the event was no surprise, but she proved her status as the favorite and took home her first Olympic gold medal. The next noteworthy Olympic victory came from the Figure Skating Team Event, where the United States won the bronze. Just like slopestyle, this year marks team figure skating’s debut in the Olympic Games. Previously, for figure skating there have only been individual events for ladies, men, pairs, and ice dancing. 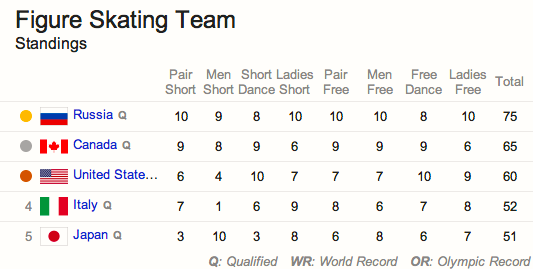 However in this event, all four of those disciplines are combined into one event. The event stays true to the typical figure skating competition with a short program and a free skate, but what differentiates it is that after the short program, only the top five teams continue onto the free skate. To determine the top four countries, points are tabulated after each section of the competition. For example, after the individual men competed, the skater in first place received 10 points, second place, 9 points, third place, 8 points, and so on. After each section, the individuals or pairs received points based on their ranking and all four rounds were added together to determine the five countries continuing to the free skate. In the end, Russia, Canada, the United States, Italy and Japan were the five that made it in that order. As for the United States’ performances, the short program got off to a rough start with men’s skater Jeremy Abbott hitting the ice while attempting a quad, while pairs team Marissa Castelli and Simon Shnapir finished their round in fifth place. Things got better as Ashley Wagner, grasped the forth place spot with a clean performance. Following her disastrous and almost Olympic-dream ending performance at Nationals, Wagner was relieved and said she proved herself after her Olympic debut. 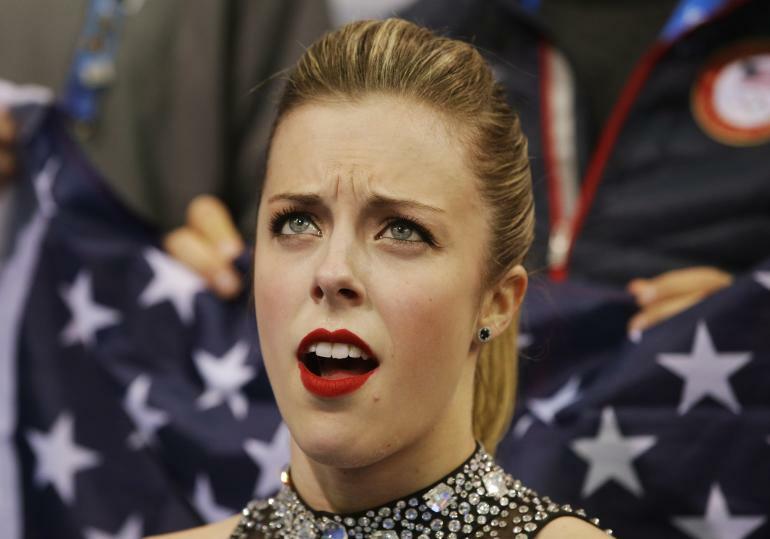 However after receiving her score, this face, now a popular internet meme, showed her discontentment with how the judges rated her. Vancouver ice dancing silver medalists, Meryl Davis and Charlie White, redeemed the American team by scoring first place in their round and pushing the United States to the third spot overall. As for the free skate round, every team was allowed skater substitutions and the United States took advantage of that, putting in 19-year-old men’s skater Jason Brown and replacing Ashley Wagner with national champion Gracie Gold. With the United States having solid performances from all four disciplines in the free skate, they held their bronze medal spot. However, the stars of the night were Evgeni Plushenko and Yulia Lipnitskaia, Russia’s individual men’s and ladies’ competitors. With strong performances from Russia and Canada in the short program and the first two rounds of the long program, logistically there was no way to alter the medals table. That meant that despite their performances, it wasn’t possible for Gracie Gold or ice dancers Davis and White to get ahead of their Russian and Canadian counterparts. Despite this, both Gold and the ice dancing duo scored their highest points ever in competition, creating scores that became their new personal bests. For the United States’ final medal of the weekend, women’s mogul star Hannah Kearney won the bronze in her event on the first day of Olympic competition in Sochi. Although a great achievement, it came as a disappointment to Kearney who had won gold in Vancouver and was the world’s top-ranked moguls skier. If she had won, she would have become the first individual to win the gold in two consistent Olympic freestyle events. As this was her last Olympics as well, the bronze medal came unexpectedly as she had a costly mistake in the top section of her run. Kearney has been the opposite of error-prone in her past years and during her post-event interview, she expressed her feelings directly, saying she felt like the best part of her career was behind her. She even took to Twitter to show her unhappiness after the event. Despite Kearney’s disappointment, she added another medal to America’s medal count, and after the weekend’s events the United States stood at 4 medals total. After the third day of events in Sochi however, the American medal count has now gone up to 5, with downhill skier Julia Mancuso winning the bronze in the Ladies’ Super Combined Slalom. Although a few Americans did not perform as expected in their events, such as downhill skier Bode Miller in his eighth place finish, and speed skater J.R. Celski finishing forth in the 1500m short track, the first few days of the Olympics have ultimately been successful ones for the American team.